Take advantage of fresh strawberries and make these moist on the inside, crunchy sugar dusted crust in this Rosemary Strawberry Muffin Recipe. Made even more delicious because they are made with easy, freshly prepared strawberry jam! 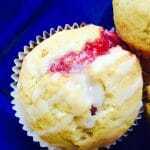 This Rosemary Strawberry Muffin recipe is a simple recipe that you can make in no time at all. Tender moist crumb in the center, swirled with a fresh strawberry reduction sauce made with fresh strawberries that will delight anyone who gets one! Strawberry Season is just around the corner. Well, the traditionally strawberry season anyways, living in California we are lucky to get great strawberries all year long. But this time of year they are crazy wonderfully delicious! Sweet, the perfect texture and ripened to just the right degree. 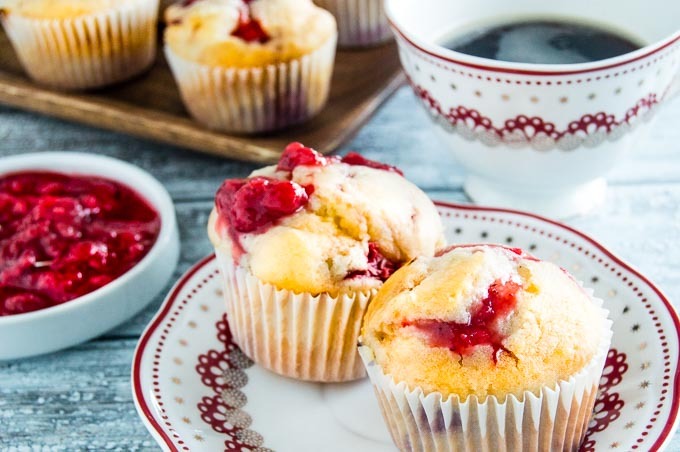 These strawberry muffins will for brunch for Mother’s Day, a gift for a neighbor or a mid afternoon snack. How do you make Strawberry Jam or Strawberry Compote? 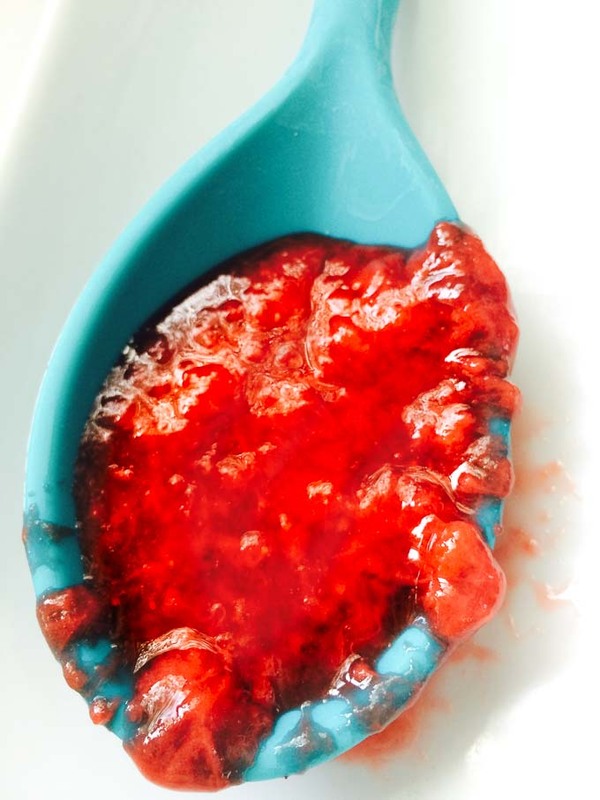 You wont believe how easy making fresh strawberry compote is! 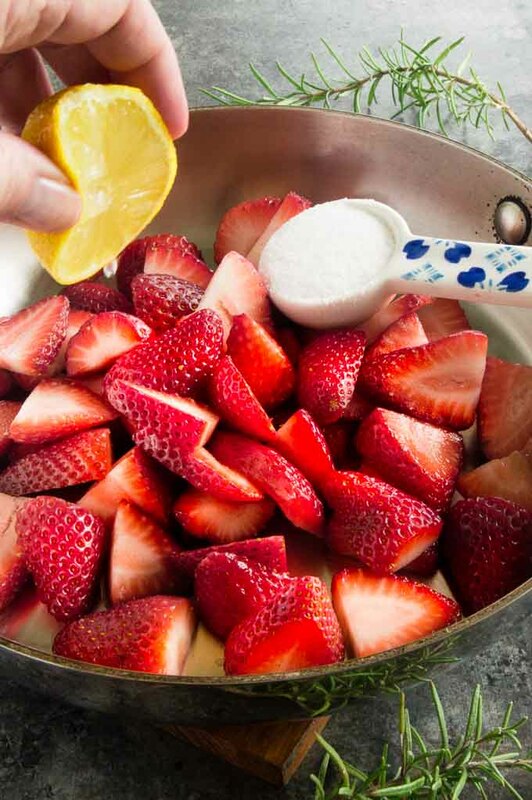 Its as simple as cutting the strawberries and placing them in a a skillet with a small amount of sugar and a squeeze of fresh lemon juice. Then you turn the heat and let them reduce down. As they cook, you’ll use a slotted spoon or fork to mash them down. Be gentle with the rosemary sprig. You don’t want the sprigs to break off. By cooking the sprig with the strawberries the strawberry compote is just slightly scented, not overpowering. Once its all done you will end up with a reduction that looks something like this! 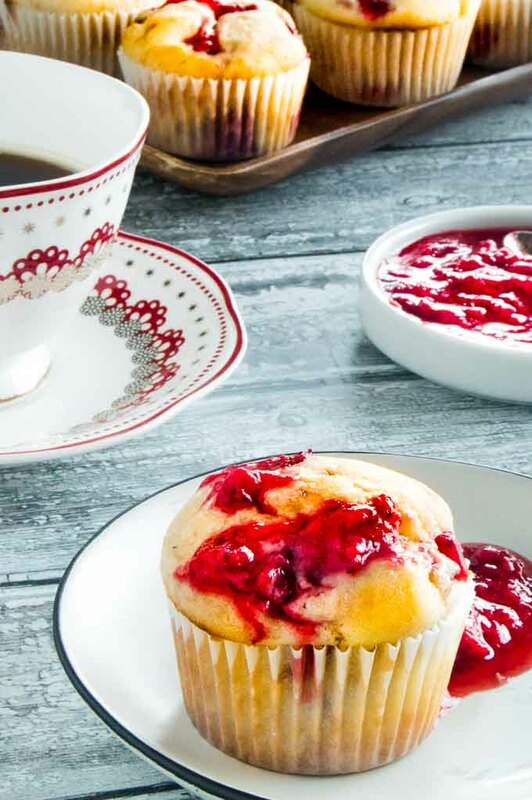 This recipe will yield a LOT more compote/jam than you will need for these muffins. You can store the leftover in a sealed container in the fridge for up to a week! Can I use frozen strawberries instead of fresh in this Strawberry Muffin Recipe? Absolutely you can! Follow the instructions in making reducing them down but be sure and taste the mixture before stirring it into the muffins. Fresh Strawberries in season are pretty sweet. You may need to adjust the sugar (increase it) just a little to get the desired sweetness! How do you make strawberry muffins? This muffin recipe is a great base for any muffin you want to make. The trick to successful muffins is in how you prepare them. Mix the dry ingredients first then sift them so the ingredients are mixed evenly; it also keeps the muffins lighter and not dense after baking. Mix the wet ingredients together then stir just enough to just mix the dry ingredients into the wet. Finally you swirl the strawberry mixture in. 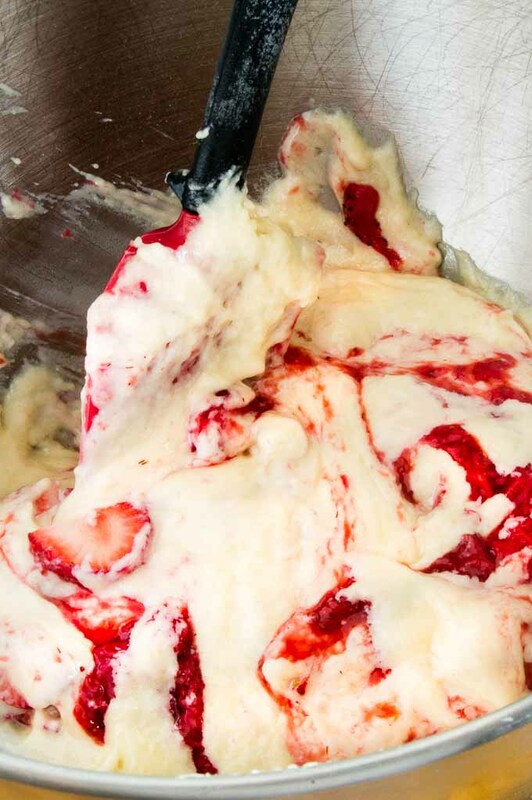 You just swirl them in so that you see streaks of strawberries and the batter stays creamy in color, not pink. You can also chop up fresh strawberry pieces and put them in at the same time if you want a couple of different textures in the muffins. 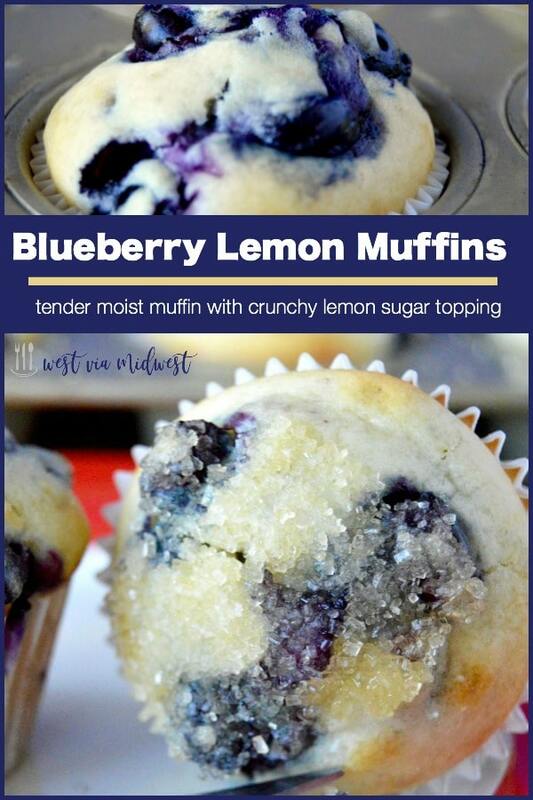 The base of this muffin batter is a great base for any berries you have, blueberries, blackberries, cherries. It’s not too sweet and the lemon zest adds just a bit of brightness. The muffins are moist on the inside, but the top crackles and gets a little bit crunchy. Use muffin liners and fill them 3/4 of the way up. You can also dot the tops with additional jam or strawberry pieces if you want. 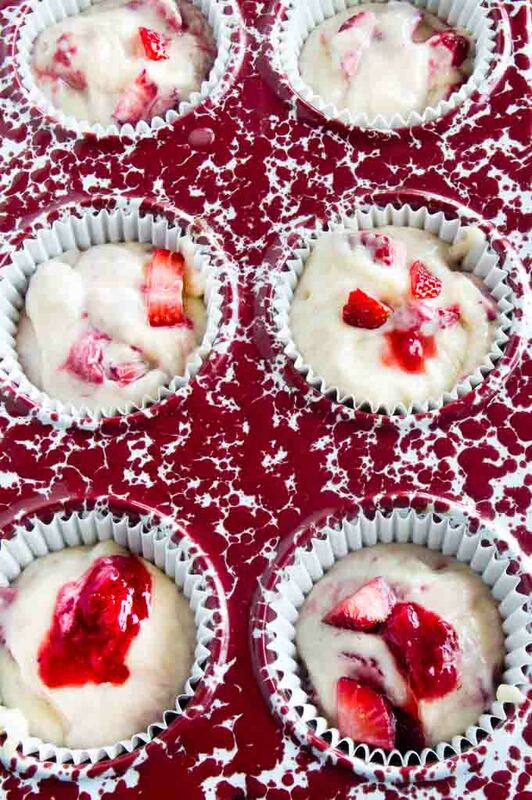 I do this so every muffin when out of the oven and baked is clearly loaded with strawberries! Looking for other fruit/berry recipes? Check out these blueberry lemon muffins or this cherry apple pie! Take advantage of fresh strawberries and make these moist on the inside, crunchy sugar dusted crust Strawberry Rosemary Muffins. Made even more delicious because they are made with easy, freshly prepared strawberry jam! 2 Tablespoons grated lemon zest. Clean strawberries, removing stems, and andy green parts. Add sugar and lemon juice to pan. Gently mash strawberries and stir until they start bubbling. Then add rosemary sprig to mixture. Continue to stir, without breaking the rosemary sprig. Let cook for 10-15 mins until strawberries are completely broken down. Once cooled remove rosemary sprig and throw away. Store unused portion in refrigerator in a sealed container. It should be used within 3-4 days. Line muffin tin with paper-liners. Take Rosemary sprig and sugar and stir for 30 seconds in a bowl. The rosemary oil will impart to the sugar. Let set for 5 minutes. Remove rosemary. In a large mixing bowl sift together Flour, Rosemary scented sugar, baking powder and salt together. In separate bowl mix together wet ingredients, eggs, oils, almond milk and vanilla. Mix until it is just combined, DO NOT OVERMIX. Once combined, add lemon zest with 3-4 turns of the spoon. Using an ice cream scooper/ or spoon fill muffin liners 1/3 full. Then put a small spoonful of strawberry jam into the muffin liner. Cover jam with another scoop of the muffin batter. Bake for 15 minutes turning the pan at half-way. Test muffins with a toothpick. If the pick comes out clean they are done. If the pick comes out wet with batter place muffins back into the oven on a lower shelf for 2-4 minutes until cooked through. You may want to lower the muffins to a lower shelf if it looks like the muffins are starting to get brown. Remove from oven and cool in muffin tin for 5 mins, then remove to a wire rack to cool. When muffins have cooled, dip them in melted butter then directly into sugar. Serve with leftover strawberry jam and or butter. Best served warm, so if you make the night ahead you can microwave for a few seconds to rewarm them. If you don't have almond milk, you can use dairy milk. But if you do, eliminate 2 Tablespoons of flour from the recipe. Alternative to having layers of muffin batter, strawberry jam, then muffin batter you can also swirl in the jam to entire muffin batter. Distribute gently through the batter and fill muffin liner 3/4 way full and bake as directed. If you make these the night before you're going to serve them, wait to dip them until morning. The sugar and butter mixture will present better this way. Theres so many strawberries the jam is a nice change up in our muffins! Thanks for stopping by! I love strawberry. Great recipe. I like the idea of adding rosemary with strawberries – my son and I like to mix up flavor combos when we make muffins – his favorite is peanut butter and jelly. Mine is cranberry and lime 🙂 Thank you for the inspiration! I’ve never heard of anything with strawberry and rosemary combined but it sounds delicious! Can’t wait to try! This looks so delicious!! I can’t wait to go to the strawberry patch this summer with the family!! Yes, please! These muffins look beyond amazing, so I will definitely have to make these sometime. Thanks for sharing the recipe! These look like a great dinner muffin. Somewhat sweet but savory too. I love it! I love the combination of rosemary and strawberry together. What a complimentary flavor. I love anything strawberry. These muffins look heavenly and the perfect treat for morning or night. These look so yummy! I never would have thought about adding Rosemary! Muffins are such a quick grab and go kinda food. These are to die for. Making me so so hungry 🙂 must try these as I love baking!! This looks delicious Michele. I bet the rosemary and strawberry flavor combination is wonderful. Homemade strawberry jam on anything is delicious. This muffin recipe definitely makes for a great breakfast. And yes, here’s to long weekends and the sweet treats that go along with it! These sound so amazing! My little one loves strawberry, I am going to have to make these for my kiddos! Wow, wow, wow! 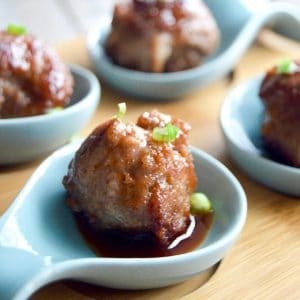 Those look so amazing. I bet my kids would love these. These look like such delicious muffins. I’m always looking for new muffin recipes, they make the perfect snacks! You and I are on the same page with muffins! I love to snack on them! Stop tempting me with these delicious muffins they are divine I would love to eat this and watch everyone stare at my delicious muffin with envy. Muahaha all mine! Oh my word these look amazing.. we have both strawberries and rosemary planted in our garden this year, I never thought to combine the flavors. Thanks for sharing. These sound awesome. I Have never had rosemary in muffins before, but it sounds amazing. Wow look at that strawberry!! I wish I could eat these muffins right now! I will have to save this to make on the weekend! Oh WOW Michele–all I can say is WOW!!! These look scrumptious! 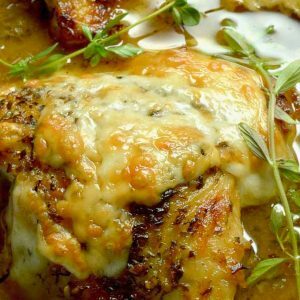 And the rosemary kick–my perfect call to make this right away!! Fresh muffins are definitely worth the effort! But wow you make the jam seem so easy!! 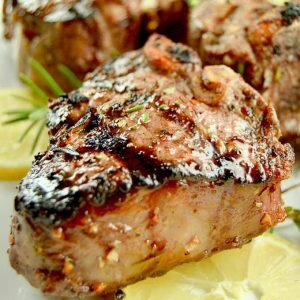 Oh my gosh I LOVE the combo of strawberry and rosemary! These muffins sound amazing! Rosemary in strawberry jam? That sounds absolutely incredible. Also these muffins look/sound amazing! Thanks for the recipe. Thanks Taylor! Hope you enjoy them!! 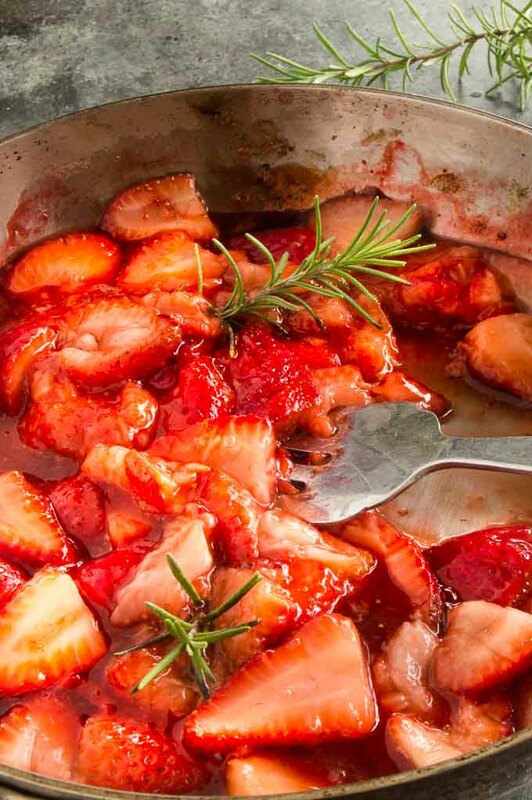 I made strawberry jam with rosemary once and it was amazing! These muffins would be perfect for mother’s day brunch. I am obsessed with herbs in sweet things (and cocktails). I’ve tried strawberry in basil but not rosemary. Great idea! Basil would be awesome too Emma~ I may have to try that as well! Goodness these look absolutely amazing! Perfect for snacks, lunches or to curb a sweet tooth! Impressive presentation! 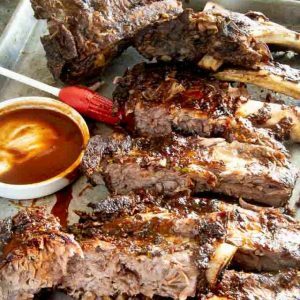 I will have to make some…my mouth is watering.